Although options abound for pho in the core (including Chinatown, of course), my other favourite noodle soup, ramen, is a bit more elusive in this area. Nomiya in Oliver Square, Kiwado near the Royal Alex and Prairie Noodle on 124 Street are the closest, but I’ve been hoping for something within closer walking distance. 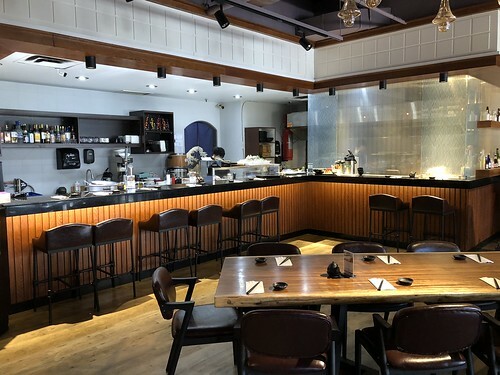 As such, I was happy to hear that Let’s Grill Sushi and Izakaya serves ramen before 5pm on weekdays, and was keen to try it out. A few weeks ago, I met up with Linda there for lunch. Although the restaurant wasn’t full, there was a steady flow of customers, including some ducking in for take-out. I liked the openness of the dining room, with a variety of seating options to choose from, including a nice sized bar for those inclined to watch the action behind the counter. I also appreciated the wide space between the tables (although I didn’t have Emily with me, I could have easily parked the stroller next to our two-top). A sign outside the restaurant touts that the broth cooked for 10 hours, which seemed like a good start. 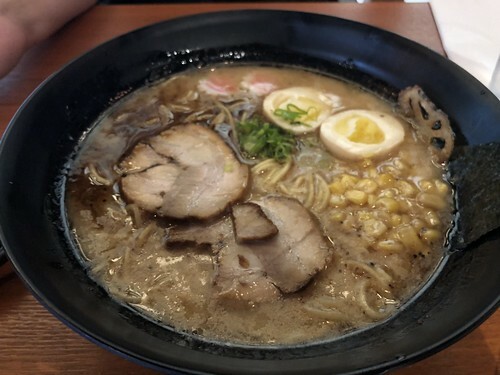 At lunch, diners can choose from four types of ramen. 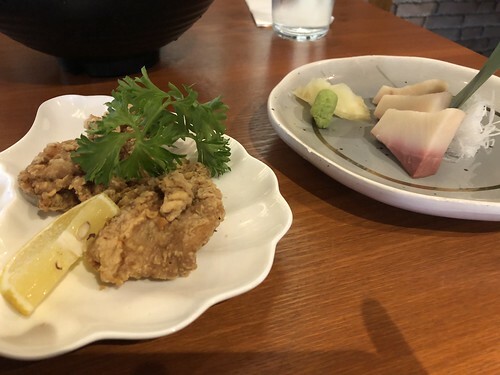 And similar to Kiwado, which offers the option to add a side, Let’s Grill sells a $5 combo upgrade that includes a choice of three sides (3 piece chicken karaage, 4 piece tako yaki, 3 piece yellowtail sashimi) and a tea or pop. 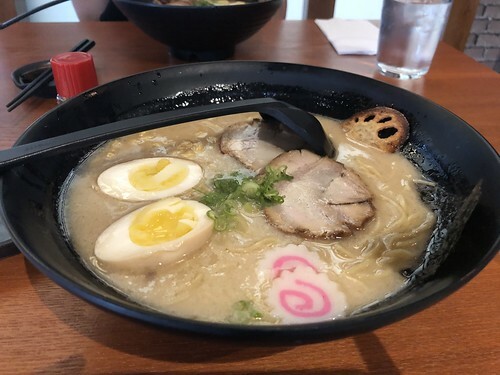 Both Linda and I opted for the combos – she added sashimi to her black garlic ramen ($14 +$5), while I ordered the tonkotsu miso ramen and chicken karaage ($13.50 +$5). Our food arrived fairly quickly. The broth was pretty good, with a nice creaminess that I enjoyed, and the noodles were cooked well. The egg yolk wasn’t as soft boiled as I would have preferred, but I did like that the chashu pork wasn’t as fatty as others I’ve encountered. As for the sides, the karaage was a decent sized portion, though it could have been crispier. Linda enjoyed her sashimi well enough. Service was friendly, perhaps so much so that it was only after we left the restaurant that Linda and I realized that we were never served our combo beverages! Overall, I had a positive enough experience that I wouldn’t hesitate to return to Let’s Grill for ramen again. Hurrah for more noodle options in the core!